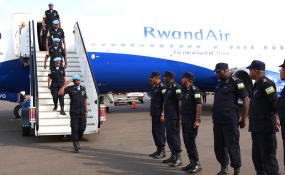 A contingent of 140 Rwanda National Police officers jetted off to the Central African Republic aboard a RwandAir flight for a one-year peacekeeping mission under the United Nations Multidimensional Integrated Stabilisation Mission in the Central African Republic. A contingent of 140 Rwanda National Police (RNP) officers under the Specialised Protection Support Unit (PSU IV) yesterday departed to the Central African Republic (CAR) aboard a RwandAir flight for a one-year peacekeeping mission. The officers will operate under the United Nations Multidimensional Integrated Stabilisation Mission in the Central African Republic (MINUSCA). Prior to their deployment, the officers were briefed by the Deputy Inspector General of Police in charge of operations, DIGP Felix Namuhoranye, who urged them to remain professional, disciplined and to perform their policing duties with excellence. Namuhoranye urged the officers to build on their predecessor's legacy, who were branded by both national and fellow peacekeepers for performing duties with due diligence and high level of professionalism. Namuhoranye expressed confidence in the skills, knowledge and capacity of the deployed officers in view of the challenges they would face in the fragile security situation in CAR. The force is mandated to undertake special duties such as protection of VIPs, key installations and infrastructure. Police officers board a RwandAir plane at the Kigali International Airport en route to Central African Republic yesterday. Courtesy. The contingent commander, Chief Superintendent of Police Emmanuel Kabanda, said they will operate in the capital Bangui, and that the contingent's focus will be the "success of the implementation of our mandate." The returning contingent was commanded by Assistant Commissioner of Police Emmanuel Hatari, who noted that the force under his command performed well as per the mandate. ACP Hatari commended the discipline and dedication of the officers as well as the good relations between them and the local population, which partly facilitated them to accomplish their duties. "Besides peacekeeping, we also contributed to sustainable development of the people of CAR by providing medical services, helping the needy and participating in community work activities (Umuganda)," he said. Rwanda National Police maintains three contingents under MINUSCA: two FPUs and a Protection Support Unit, each composed of 140 officers. Rwanda has 1,199 police peacekeepers deployed in UN missions in Sudan, Haiti, South Sudan, Central Africa Republic and Abeyi.